Tesla shares rose to $313.38 this morning, giving the company a market capitalization of about $51 billion, surpassing GM for a moment as the most valuable American automaker. This left some industry insiders wondering about tulip bulbs. ← Green Shoots! Is Argentina’s Economy Finally Growing? Hi Wolf, thanks for another great article. A minor point – yes, lots of other auto makers have got into ‘electric’ cars, but I think most if them (sensibly) are hybrid, unlike the fully battery powered Tesla, and have a decent range which is important here. Here in Oz we have (relatively speaking) quite a lot of hybrids on the road, mainly Toyota and Lexus. The Toyota Prius is popular as taxis – their largest avoidable cost is fuel. Teslas – not so much. … and more … all pure EVs. Toyota offers a fuel-cell EV where a hydrogen fuel cell replaces the battery. Feel free to add EVs to the list. Even smaller brands that no one has heard of. At the other end of the scale, the Rimac Concept One is probably the coolest EV. In China there are more EV’s than this list. The ones I see the most are BYD and Zotye. The Zotye’s are the size of a Smart car and are used for the rentals that are everywhere in every city in China. They are run like ZipCar. An Italian company is first, but I see others now. The problem with EV’s in China is that everybody except the rural poor live in mid- and high-rises. The underground parking garages need to be wired for individual electric before you can put in chargers. Which then begs the question . In light of all the major manufactures agreeing EV’s have no viable long term future … along with the fact that despite Musks’ attempts at cronyism with the swipe of a pen our ‘ so called ‘ president has put an end to all EV subsidies – guaranteed government loans – tax credits – carbon credits etc … all of which despite the supposed investment cash coming in * TESLA is heavily dependent upon for its survival .. how much of a future can TESLA possibly have ? * Many thru out the industry are seeing questionable practices when it comes to the purchase of TESLA stock ..
OK, I sympathise because everyone thinks their opinion is valid, but just a hint — if you want to be taken seriously, don’t try claiming that all the professionals agree hydrogen is the future . . . If you stop to actually analyze these, you’ll realize that most of them have barely enough range to get down the street. The only exception? The Bolt. It’s production-capacity-limited to 50,000 with no plans to expand beyond 90,000. The Hyundai Ioniq Electric is a nice electric car, again with planned production capacity of 50,000. There are some other *major* electric car brands you’ve never heard of. They’re all in China. BYD, BAIC, SAIC, Geely, Zotye, Kandi. They all suffer from short range, and except for BYD, low production capacity. Other than Tesla, the two companies planning high production capacity are BYD and Nissan. Nissan actually has high production capacity on the Leaf, about 500,000. And they’re planning to give it enough range in two years! Of these companies, exactly one has access to a fast charging network for long-distance travel. Guess which. None of the others are even planning to build one. Don’t get me started on the Toyota Mirai. Let me just say that if you take it seriously you haven’t even *started* to research the business and should admit that you don’t know what you’re talking about at all. Of startups, Lucid is the only one with a chance. Of these, the vast majority (including even BYD) are weighted down by a large ICE investment which will have to be written off bit by bit. Tesla’s the only pure-play. You know how stock investors like a pure play! This is so much nonsense that I won’t even respond item by item. I’ll just say this, a friend of mine has a Nissan Leaf, charges it up for free for the next two years at public fast charging stations (25min), and commutes 90 miles to work round trip, every day, and loves it. Nissan is trying to sell me a fully electric van. It’s called the eNV200 and it’s basically a made in Spain NV200 with a fully electric drivetrain from Japan. It’s very nice, probably too nice for a van, but it’s still short on range: in the real world you’ll get 100 miles from a charge. Good for use around town, not so much in a rural area. I’d need 30-40 extra miles from a charge before seriously considering it. In my opinion the truly good thing about electric vans is our idiot drivers cannot irreparably damage them by red-lining a cold diesel or going around for a couple weeks with a low oil light warning. You have no idea how much driver’s carelessness cost us. Teslas were hugely popular as taxis in the Netherlands (at least in Amsterdam) until the government stopped offering ridiculous tax breaks for them. That said, taxis in the Netherlands are generally premium brands with Mercedes getting the most market share (tax deductability, it never really made sense to me, either). Mercedes used to own the taxi market lock, stock and barrel for the simple reason they offered ridiculous discounts to licensed taxi operators: back in the 80’s, when associating Mercedes with the words “incentive” and “discount” was a capital offense, MB gave taxi companies and individual license holders 30% off list price, plus priority in workshop repairs and service and 30-40% off transmission and engine replacement (not rebuilds). At those conditions MB literally savaged the competition. To top it all up, Daimler owed a lot of their success to the OM617 diesel, which was head and shoulders above all passenger car diesel engines of the period. Hell, it was the only diesel worth having. As several MB people told me, the OM617 engine, built leveraging heavily upon Daimler’s first line of business (industrial vehicles) was one of three corners upon which their success was built, the other two being their rustproof treatment (which other manufacturers took many years to match) and “the customer is always right” philosophy. “You have to much money your wife drives a mercedes”. In Europe where there are no big import taxes on them they are economic and good vehicle to use as a Taxi. They do the miles, and dont stop. Just remove Tesla and insert any number of high tech or market darling companies and you have the same result!! Pie-in-sky valuations based on hype and hope. “If lenders and investors someday decide to pay attention to **************** losses and cash-burn, they too might walk away. But that’s not going to happen in this stock market. For GM, it too took a special event: the Financial Crisis. Or maybe a return to sanity……………. Amazon maybe also? Not to mention Google. Where did THEIR ludicrous share price come from? At least Telsa makes things…high-end, tech-limiting, but still things. These ludicrous valuations are due to one thing: the Ponzi market levitated by the Fed’s deranged money-printing and gifts of free trillions in gambling money for its Wall Street partners in crime. Google’s search business prints money. Not to mention YouTube. They have so much money that if they’re not taking some of it and putting it into moonshots with <5% of being viable they aren't responsibly managing it. I mean, look at their balance sheet, $86 billion in cash? They could buy the next 5 competitors without even going to the market to raise funds. That's insane. Amazon brought in $140 billion last year, and continues to still gobble market share because they're reinvesting in their business. But you're right. Buy Tesla because they make something shiny you can sit in! That's fundamental investing! Just to add on, because when you’re talking in numbers this large it’s hard to grasp just how much money this is, Google’s cash reserves are approximately the size of the endowments for all of the Ivy League schools combined. Like J Bank posted below, Google makes a boatload of money from their ad business. Billions a year. They also own a ton of subsidiary businesses (hence the change to “Alphabet”), many of which have nothing to do with the internet at all. They’re involved in fiber optics (internet provider), healthcare r&d, automated driving, advanced AI, and just about a hundred other things… oh, and they also have subsidiaries that are basically just Google hedgefunds / VC firms, investing in tons of startups and public companies. The “return to sanity” will be when there is a return to real interest rates. When the Fed understands that the purpose of interest rates is to value the cost of funds/money. This will happen when market interest rates are based upon the real interest rate, rather than some hopium dreamed up by some bankster in the Eccles building. Meh. Real businesses borrow real money from real banks at whatever interest rate the bank charges. The bank decides the cost of money. Not the Fed. The problem is that the cost of money is low, because there is little to no growth in the economy. Fed interest rates are a reflection of that, not the cause. The 10-year is basically inflation + real GDP. The 10-year is 2.3%… what does that tell you? The bond market does not believe in the Fed, or Trump, to be effective in generating growth. They were fooled multiple times by Fed rhetoric about how inflation was a huge concern, employment was solid… and it has never once materialized. We’ve been stuck in a quasi-depression since 2007, inflation is low, growth is low, there is no justification for higher rates. No, in fact the only time interest rates have attempted to move higher in the last 10 years was based on hopium (that QE would be effective in stoking growth and inflation)… and every time, when the economy continued to languish, rates came back down to reality. Without a miraculous explosion of growth and inflation, there’s no justification for higher rates. Contrary to what you may read here or elsewhere, the Fed has been totally irrelevant to inflation and growth. Don’t believe me? Go look at CPI, look at when the Fed has enacted their various QE programs, and you’ll note that there’s approximately zero correlation. Yes, the Fed had little impact on consumer price inflation as measured by CPI. But it had a HUGE impact on asset price inflation. Bernanke explained in an editorial in 2010 that asset price inflation was the Fed’s goal. It would help boost the economy, he wrote. He called it the “wealth effect.” And that’s exactly what we got – minus the boost to the economy. A big firm needs to go belly up to save the whole? Or maybe that is what citadel is all about? The fed needs to hoover up any mess in the money markets hence a fresh supply of impaired assets would mix well with its none government paper its balance sheet needs to jettison? The fed needs a lot of small transactions to counter the recent gang assault from LA dolce vita on said money markets! We can never have nice things like peace and/or freedom! The fed needs to increase pressure on the long end , at a time of increased chance of policy error? Absolutely. It was ‘trickle down economics’ by another name, essentially. QE was, by every grounded measure, totally ineffective in contributing to the real economy (and by virtue, inflation via CPI). The fact that it took 3 of them… none of which did much other than provide a short-term confidence/optimism boost, speaks to that fact. And now the Fed is left flailing in the wind, without a clue as to why the economy continues to remain sluggish. Labor markets are strong? Sure, if you just look at the unemployment rate (U-3). But look at the more complete picture (i.e. U-6) , and it’s by all means still quite weak. “4.5%” unemployment, yet wages are still flat to actually declining on a real basis? Yeah, those two things don’t jive. But as long as the Fed continues to base their decisions on increasingly irrelevant measures, they will continue to miss the mark. Will a war that requires conscription a la WWII solve this problem? We rebuild the nations we destroy during the war. And then we bill them and give breaks to companies that build in US. Or is this a fallacy like the broken glass fallacy? No basis in fact. Created from fairy dust and hopium. These “creative” stock values assigned to Tesla are about $5 billion higher than Ford’s. Yet Tesla delivered only 79,000 cars in 2016, while Ford delivered 2.6 million cars! Fake markets. Tesla is the JDS Uniphase of this bubble. Eventally, somebody is going to take a bath, but even “solid”companies are good shorts. Pepsi, McDonalds, UPS… they’re all stupidly valued. The question isn’t IF we can short, it’s the timing. These tech companies are so difficult to invest in, value, etc., that even though I grew up around and did business with silicon valley companies in the ’70’s, I have never really invested in any of them. JDSU did have a reasonable set of products. However, as usual, the use of options, etc. made it so that the few got rich quick with the hit and run approach. Actually, the main line/old corporations are trying to do the same kind of thing when they do all that M&A. Buy/sell at inflated prices, and the execs, bankers and law firms walk away with millions. The average employee may keep their job, but thousands do not usually. The remaining companies are usually weaker after the M&A/spinoff according to the academic studies (and my experience). Kevin, any thoughts on internet advertisers? – Large amounts of accrued advertising costs. Companies can amortize advertising over 5.5 years, depending on the product. I used pension analysis to short GM back in 07. I think these 4 qualities could bankrupt a company. That JDS similarity is right on. I’m guessing the “Shareholder litigation” papers are all ready to go once the boom busts. Yip Fed thanks for nothing. If you were an elected body you would have been FIRED a long time . You may have noticed that I pulled the “follow comments” button off the bottom of the comments page. I did because I had some complaints that by clicking it, the inbox got stuffed with dozens and dozens of these notices of new comments. And there was some confusion: people who tried to unfollow the comments accidentally unfollowed the WOLF STREET email updates (easy to do!). I cannot modify what the button does. It’s either on or off. So let me know how you feel about the button: Do you miss it? A good thing it’s gone? Should I put it back? HI Wolf! Regarding the Follow Button: I personally like to follow the conversations that are of high interest to me. Otherwise one has to reread all comments to see which ones are new. Put the button back please. For heavens sake people…you don’t want to Follow, then don’t click the damn button! I bookmark the page after I make a comment, so I can check for reactions whenever I like, without an automated obsession for following each one. The ‘ Follow Comments ‘ function I never use … so no loss . But … why is it my every comment comes up ‘ Awaiting Moderation ‘ finding their way onto the page afterwards .. with the exception of a week or two here and there when my comments are allowed sans moderation ? Am I missing something ? Doing something wrong ? If so please let me know so I can rectify the problem on my end . If not .. can it be fixed on yours ? Your comments tend to shoot from the hip and hit real people. Also, this is not a political site, and many of your comments are political. The tone here is civil. I don’t like it when commenters snipe at each other over their political beliefs – or really over anything else. Disagreement is good, but it needs to be fact-based. So I want to review your comments first before they go public. That’s all. Gotcha . And mea culpa . Thanks for the clarification . Knowing this I will gladly be more careful , considerate [ assuming the person replying to me is doing the same ] and avoiding ‘politics ‘ unless it is absolutely relevant to the topic in the future .. It gives the option to follow the tread without being notified of every new Article on WS. Sometimes comments are made in threads you do not wish to follow. and so you dont activate it. Further it informs you when others have replied to your comments which is information I currently am not receiving. which makes my appear rude for not replying? It is also the default for most Discourse applications. Some in fact will not allow it to be turned off. Not having it will reduce you page returns, and total page view’s. Which will reduce your revenues. Which is why Some discourse Applications, will not allow it to be turned off. The production workers at Tesla also make far less. The national average is $29 an hour for motor vehicle manufacturing. Tesla workers make about $10 an hour less. (Musk has no tolerance for unions either stating, “there are really only disadvantages to someone to want the UAW here”. Please also remember that Musk had nothing to do with actual Tesla engineering. He came along after the first prototypes had already been made. He’s nothing more than a talking head and is reaping many more kudos than he deserves. You can search on the internet if you doubt me. There was also a court case (settled) between the *real* Tesla geniuses and Musk for defamation, iirc. Well, he’s a little more than that. He is a real visionary and quite a promoter. His work in solar is amazing. He may not be the designer/engineer but he understands them and is able to move us towards an interesting future. What? There isn’t a single video, there’s hundreds if not thousands. I’ve never seen one that blacks out. Hey, the thinking I am seeing here about the ‘stock market’ is a throwback to the 1990’s before that “in-ter-net” thing became popular. Retail stockholders have become a shrinking percent. Trading is overwhelmed by HFT and hedge funds, and pps is king…the direction, the amount, everything. It doesn’t matter if the company is selling Porsches or Pickled Herring, what matters is the algorithm that moves the stock price per share, leaves the algo competition scratching their heads (here, for Tesla, the shorts). I expect Tesla shares at $400 before $200. It is crazy, but we have no idea about those algo’s. The current valuation of Tesla (and other imaginary companies) reflects the value of borrowing of dollars at a price is almost zero. It is the same phenomenon that allows automation to replace humans and the inconceivable amount of commercial real estate construction. Meanwhile the rest of of us “humans” must toil and earn. Something seems quite unfair about that. I have the perfect solution and Elon Musk will definitely agree after Solar City. Have Tesla acquire Uber. The synergy would be mindboggling. I’ve read in 2016 Uber beat the previous record (set by Amazon back in the dotcom days) for quarterly cash burn. By pairing Uber to Tesla Elon Musk would become the undisputed master of cash burn for many years, and possibly decades, to come and earn a place in history. Crazy. You’d think that GM’s real estate holdings alone would be worth more than Tesla in its entirety. Not crazy. Real estate is overrated now that retailers are going bankrupt everywhere. 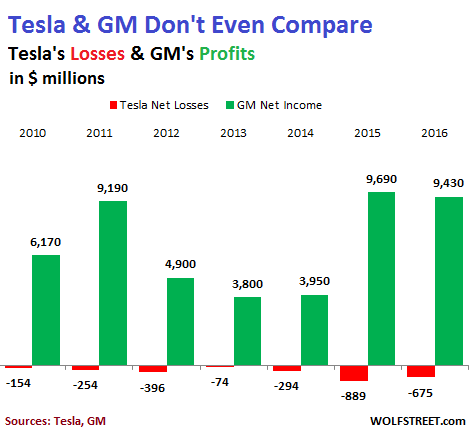 But Tesla has something that GM does not have ….. HOPIUM. And Muricans should know that HOPIUM costs dear indeed. That’s it, I think. With a proven technology, the ROI has been proven, and it’s proven to be not very much. Like I said, what if ZIRP is real? What if the return on the average garden-variety investment is next to nothing? Then even a glimpse through the weeds of something that might turn out to be a high-flier will be wonderful indeed. It’s pure speculation that a disinterested middleman can make waaaaay more money than an owner/operator. I’m part of a company that was recently sold off and has gone from public to privately owned by PE. As part of that, some people had to get out of the corporate owned/leased offices. Some of my colleagues migrated to WeWork, which is again a middleman office space builder/manager between owner and leaser. I suppose there is some secret sauce that makes WeWork “worth” north of $20 billion, but visiting my colleagues in their new near Times Square office in NYC left me wondering how WeWork makes money as a middleman. Seeing as autos are really just retail.. it wouldn’t be beyond logic to see the auto malls do the same as the other retail malls. So much money spent in huge lots and inventory and receding customer ability to purchase. As for GM’s real estate, it is mostly in manufacturing and not in retail. What’s an abandoned lumber mill site worth? What will and a closed auto manufacturing site worth? You do know that most of GM’s real estate is in “hot markets” like Detroit, right? And most of it has a century of contamination by pollution due to sloppy practices? GM got rid of all its old useless plants during the bankruptcy. It’s plants today are modern and in great shape. Granted, they aren’t worth a fortune since they’re not located in the middle of San Francisco. But guess who ended up with one of those GM reject plants? Tesla. Elon Musk reminds me of “Marge vs. the Monorail” (https://www.youtube.com/watch?v=5GcJsgqfxU8). I have a feeling that Musk and Tesla are gonna end up the same way :). No love for the giant magnifying glass? MC: LOL!!! His rocket or solar business could end up heading that direction. We are accusing the Chinese of subsidizing their solar cell industry with low interest loans. In the US we subsidize Wall Street Banks with null interest loans…..I guess it boils down to what you think is important. My guess would be market manipulation by stock owners by buying the share from each other at a smaller loss than the gains after selling them. Of course, this is only a guess, but automated electronic transactions are the overwhelming majority these days and the math in the article adds up, if my assumption is correct. Of course, there can be a large number of legitimate reasons besides this. Chinese new regulations : 75%x25,000,000 brand new Tesla/ yr.
fast and paid for fast. “REAL GOODS”. “Real big BILL”. Also, consumed very fast, like a chocolate bar, especially the tires. Tesla deserves the high price, because of it’s highly negative ROE. Charlie Munger loves chocolate and he is not going into a Tesla. There is nothing REAL about Tesla. Sadly the new feudalism looks like it may work. Bought legislature sits on their thumbs and leaves all decisions to unelected bankster-directed technocrats. Yellen is taking her victory lap now. Yellen is taking her victory lap now. Don’t confuse the monkey, Yellen, with the organ grinder, Goldman Sachs. Amazon has a moat; Tesla does not. Plus, how many people in this world can buy $90k cars? How many of those people will buy $90k cars if their stocks drop by 50%. Lots of risk involved with Tesla’s stock relative to the upside. FWIW, a lot of this is built on the expectations of the upcoming “affordable” Tesla. I recently read where Tesla makes money selling its pollution credits to polluters. Well, I guess somebody needs to buy fertilizer for the tulips. So Mr. Richter suggests EVs need three things to be more than an exotic alternative to conventional cars. 2. A vast increase in charging infrastructure. 3. Be competitive with gas w/o subsidies in the mass market. Assuming any or all of those criterion can be met why should anyone assume Tesla will be the one that achieves it? Why not GM or BP or some unknown to us today company? Big pharma and tech like to prowl amongst smaller companies and start ups for promising new drugs/technologies and when they find one they buy it. Auto technology maybe old and not as glamorous ( though the rush to develop self driving vehicles seems to be changing that ) so assuming Tesla will be the dominant EV company could be the real ‘risk’. There are presently 42 different models of electric passenger cars sold in China, both from domestic manufacturers such as BAIC and big corporations such as VAG. The market there is already becoming brutal, with massive incentives piled on top of government subsidies. Daimler and Honda have been heavily investing in electric vehicles since the late 80’s and battery manufacturers, from Panasonic to Johnson Controls, are fighting viciously over who can give manufacturers that extra mile in range and that minute less in charge. The only things Tesla has over all these colossi are its ability to extract enormous amounts of cash from both customers and investors and an absolutely rabid fanbase. You don’t hear much, if anything, about the BAIC EX200 but you’ll hear Tesla’s praises sung from every rooftop, mostly by unpaid shills. Tesla is like an earthenware vessel among iron ones: once the padding around it is removed it will be crushed in shards so small not even a jigsaw puzzle master will be able to put it back together. I hate to say it, but your post reminds me a bit of Apple in the past, when many were skeptical of their success, because there were already many competing MP3 players and smartphones. That being said, the finances of Apple and Tesla are quite a bit different, so I’m not sure Tesla will pull it off. Good post. I am a big fan of EVs though I don’t own one and won’t for awhile. Why? Because there are revolutionary changes in batteries coming down the pike in the next few years. Tesla is spending a fortune on maximizing Li-ion batteries that have difficult limitations. My guess is a GM or Mercedes is going to commercialize a real revolutionary battery and very quickly own the market. Tesla will be remembered as a valiant also ran. The betamax to VHS. Chevy should make a mower attachment – because they are already keeping the weeds down! Its shaping into a debacle above the store? (between trump and the dealerships the pikes peak rodeo is saved! Money making and stock validations do not apply to what the underlying reason of TSLA and AMZN. If people are profit seeking by “investing” in sound cash flows, these two would not have existed. It is NOT 100% speculation either. It is something else. I think it is “investor”s are willing to give them money to change existing things even without profit. “Investors” simply give AMZN money to kill existing retails. Why? Because it has to change, and somebody has to do it. “Investors” give TSLA money because the car industry “has” to change and somebody has to kill the existing car business. Why “has” to change? Strategic energy and pollution calls from government. Elon smelled it and became the one to do it. Not for profit, but for killing the incumbent, using gov backed power and spread the risk on who ever thinks this is profit seeking. This is more than a hype. Amazon is going to print profits when they reach their endgame– owning every aspect of the storage and distribution of pretty much everything. There will be no middle man at any point, only Amazon. The moment they print money, competitors will show up and retail shops may open again. That’s my silly rebuttal. I do want to point out that people give money to AMZN because they thinking killing existing business will in the end become profit. My point is the killing process requires NO profit and once profit is on the table, those who were dead will come back to life. In short, people give money to AMZN to destroy profitability of retail. Your whole rebuttal goes out the window when you realize that Amazon is already profitable. Approaching a billion in net income in Q4. Competitors such as…? Who has the infrastructure to warehouse and ship an ordered item the same day for cheaper than what it would cost UPS or FedEx? They will have competition, but it’s hard to foresee any real competitor eating their lunch for a while. That’s the point though. Amazon isn’t profitable and likely never will be. Amazon produced a net income of $2.4 billion in 2016. In 2015, it produced just under $600 million in net income. Over the past 12 years, Amazon lost money in only two: 2012 and 2014. That said, there are many individual quarters when it lost money. And given its gigantic size, Amazon’s annual profits are minuscule. It think Amazon is along term thing and its still growing. Its biggest opponents, Jack Ma, and Ebay. It holds an awful lot of untaxed profit in havens. I would also like to see the senior staff, and board members, remuneration’s and benefits in total. It strikes me, as one of those entities, that benefits very few. Very well, and was designed to do so, possibly even at the expense of many of its investor shareholders. Amazon is a master of transfer pricing. I wonder if the same happens, to much of what should be, declared profit, available for dividends, to general shareholders. 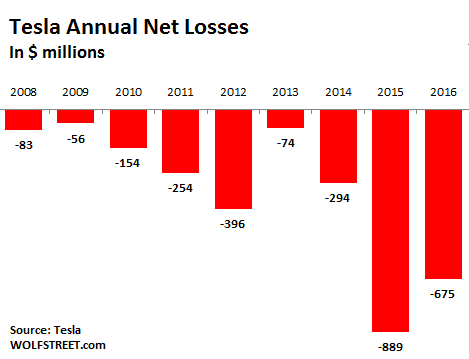 Tesla is a monumental technological and financial failure. Tesla is a battery & tech company that happens to make cars. Their valuation is wildly speculative, since nobody knows how much success they’ll have in the long run, but comparing them to GM or Ford is silly. IF (and it’s a huge if) Tesla is successful, their batteries will be ubiquitous… in every car and home. THAT is what the valuation is based on. Not how many cars they sell. Tesla doesn’t make batteries. It buys them from suppliers, such as Panasonic. And it packages them into its battery packs (this does require some technology). U beat me to it. I’m too wordy. Correct, bad phrasing on my part. Tesla is looking to be the scale producer for these battery packs. This will theoretically boost the appeal of EVs in general, and by proxy help the car business, but I don’t think the Wall St narrative is necessarily focused on cars at this point. This runs on from a conversation we had the other week/day. Tech in Betterys improves alwasy up. As Tesla is a Charger/Controller, manufacturer/fitter, as long as their “Charger tech” works or can easily be made to work, with any new advanced battery. They should be on the upside of all battery advances no?? You EV list is growing However, Honda,nissan, Toyota, MB, BMW, and Tesla. Are the only Ev’s worth knowing about that go anywhere and are not 50 second throwaways. In teh early days of Prius. A VW Salesman said to me one day. A prius is not a car, it is a household appliance. Outside the urban environment, that still applies as the EV is strictly dependant on charging source and I want to travel 1000 K in a day and not stop to refuel recharge for more than 30 Min’s. which an Ev simply can not do. As I have no notify new comment. I cant see unless I return and find it if you reply to this. That’s how I see it too, although, I don’t get Tesla’s burn rate. It’s been stated already that Tesla outsources its battery technology- it’s not proprietary. IOW, any EV maker can utilize this technology. How will that factor into the future success of Tesla’s business model? Unless the business model is FED policy -the impetus with which this stock rises thus and generates fees for Wall St. bankers, etc. What happens to Tesla when the FED reverses monetary policy course, or when said monetary policy course blows up the currency? You’re correct, however: progress in battery technology has been rapid, and continues. Billions of dollars are getting poured into it. This type of research is just one aspect of it. availability is at least ten years away. The idea that some areas of tech have plateaued is not popular but is true in a number of fields. If you fly commercially you travel at the same speed as half a century ago- 500 mph. A modern aircraft carrier travels at the same max speed as a WWII carrier- about 30 knots, or slightly more than 30 mph. PS: Moore’s Law has also reached its limits. I.e., chip memory storage is no longer improving rapidly and the price is no longer falling. ” If you fly commercially you travel at the same speed as half a century ago- 500 mph.” Due to the noise restrictions place on supersonic aircraft over land. “A modern aircraft carrier travels at the same max speed as a WWII carrier- about 30 knots, or slightly more than 30 mph.” Modern carriers can easily travel faster then 30 Knots. There is another much more piratical reason for that. Small boats at 20 and large ships at 30 start to have smooth ride stability issues. Whats the use of going faster, when it becomes to unstable to land aircraft on safely. Until they figure out how to cool/keep cool larger capacity CPU’S in smaller devices there is no point in having that much or that fast memory, the CPU can’t use efficiently. In the late 60’s F1 and US 1/4 mile speeds plateaued. As they could no longer get the extra power to the ground. As soon as tire technology improved, later 70’s speeds and times were agin on the move. Mans ability to advance, is being held back by overpopulation, and money printing (mainly in china and Europe, as excessive money printing causes problems and stagnation for all but the few, and grinds everything to a stop. To much of almost anything is poisonous, including ice cream and chocolate) not as his advancement is over. You remind me of the 19Th century paten office manager, who closed up and went home, as everything had already been invented. One brake through somewhere will revitalise dosens of stagnant fields, just a improvements in tire technology did in the 70’s, for the F1 related Auto industries. I didn’t know it was that easy to produce this quantity of power for an electric car. This also explains why current rechargeable batteries that power electric vehicles weigh so much. Tesla is the ultimate example of crony capitalism. Tesla and other EV producers have received enormous levels of government subsidies as well as regulations imposing EV development and production. The incredible losses incurred by Tesla testify to the impact of subsidies. I marvel at the technology in EVs but technology does not make a viable product. Until battery technology is viable (cost, weight, longevity, range, climate variation, charging, …), I do not see viability for EVs. The enormous government subsidies compound the problems with EVs forcing a non viable technology on consumers. The basic rational for enormous government subsidies is climate change. EVs do not solve climate change problems (I do not believe that climate change if it is a real problem can be solved). Rather battery technology creates a new set of problems. EVs on a mass scale will require large increases in base load power production (fossil fuel or nuclear driven) as well as major investments in local power grids. Tesla receives a fraction of the subsidies that the Big Three (Ford, GM, Fiat/Chrysler) automakers receive. And taxpayers subsidize big oil to the tune of about $5 billion a year. And taxpayers subsidize big agriculture to the tune of about $25 billion a year. If you’re railing Tesla for being the “ultimate example” of crony capitalism, you’ve been duped my friend. You argument does not refute my point. Without enormous subsidies and mandates, Tesla would not exist. Tesla is one company, not an entire industry. The oil and gas industry is not on balance subsidized. The industry pays enormous levels of taxes and fees at every stage of production. There are subsidies given to small producers. Depletion allowance is not a subsidy although one may argue with the levels of depletion allowance just as one can argue about accelerated depreciation. I agree that agriculture (especially ethanol) has enormous subsidies. Ethanol has the force of law requiring consumers to purchase a non viable product. Ethanol subsidies are financial, moral, and environmental disaster. EVs (especially Tesla as a major player focusing solely on EVs) receive enormous subsidies distorting marker forces. Tesla has received billions of direct subsidies. Consumers have received billions of direct subsidies. With a phase out of subsidies, a real market for EVs will develop although perhaps much smaller than some want. So true about US corn based ethanol! Sugar cane ethanol works quite well though. Ethanol does dry up some older car’s fuel delivery systems. The oil and gas industry is, in fact, on balance, heavily subsidized. Let’s start with the submarket lease rates on federal land: lower than they’d pay to a private landowner. And you probably don’t want to discuss the subsidies in countries *other* than the US, which are monumental. The “Tesla Effect” is easily explained. The Elite, including Mr. Musk, have decided that Tesla is, for the moment at least, TBTF. Tesla is a symbol of something to the Elite, but for the life of me I can’t imagine what. Maybe someone’s figured out that Musk is “all in” on Tesla and they’re just piling on for the tulip-bulb ride to the top. The problem is that, as Stockman always says, “there’s no bell at the top”. Speaking of the top, what are the rules nowadays, if any, on flash crashes? For example, where are the “breakers” set and what would happen if TPTB decide that it would be in the best interest of “national security” if the stock market were to remain closed for some “temporary” period of time? Stockman always says, “there’s no bell at the top”. And yet he keeps trying to be the bell. Poor Stockman. He’s the opposite of TBTF i.e. TSTM = Too Small To Matter. I can’t see that happening any time soon; the price of lithium continues to rise as the demand increases. Sometimes technology has it’s limits, too. Ah. That was a reference to the total cost of ownership. I just commented on the price increase of lithium battery products that I experienced. I guess, real world experience will tell as the mass adoption of electric cars is still in the future, and same for long term maintenance costs. Did you see Du 30 is trying to force the replacement of all Jeepneys with Ev’s. I see 3 issues there. 1 operators cannot afford the changeover. 2 The electricity infrastructure in that country can not ( I Believe) consistently charge that many EV’s and supply the needs of the population. 3 Who is to supply that many Electric Jeepneys in the time frame DU 30 is demanding. Who pays for the free charging? Great that you can get someone else to pay for your fuel consumption. How does this scale for a large part of the population? It’s an incentive that automakers offer, just like the $5,000 per new vehicle sold that GM offered in March. Or like 0%-financing that automakers offer. Or discounts that dealers offer. Or a “50%-off” price that a retailer offers. It’s all the same thing: they’re trying to get people to spend some money. when gas was a lot cheaper than it is now did not some us dealerships used to offer X much gas with a vehicle over Y time. Generally from their site pumps. did not realize there were so many players in the EV market . But according to this government web site the tax credits phase out after the first 200,000 units are sold post 2010 . The consensus, I gather from these comments, seems to be that the bubble will burst at some point and take all these overvalued companies with it. I don’t think this will happen. If you were a company that went IPO and/or had a ton of cash. What would you do when you think the music is coming to an end? You’ll buy out some competitor. May be Tesla will buy a small car company. May be Amazon will buy Walmart. Or may be some of these companies will sell themselves a la LinkedIn. I think this will happen to Mulesoft (they talk of event based software as if a very popular software named Kafka does not exist), which will probably be bought out by Oracle/SAP/IBM/SalesForce. that’s supposedly developing a super-capacitor for an EV. I say “supposedly” because I’ve been watching this controversial company for around ten years. At first many people were excited and thought the great breakthrough in capacitor storage had been discovered, but as time has dragged on there are those who think that Eestor has actually been working on a revolutionary new money-making oil from snakes. Regardless, if a high-storage-capacity capacitor can actually be developed, it would instantly revolutionize the automotive and electric-production industries. Theoretically, a capacitor can be recharged many more times than a battery and it can be recharged in a fraction of the time. An EV might possibly be able to be recharged in the same time that it takes to fill the tank, although I would not stand to close to the vehicle as it is recharging. They use capacitors in a lot of single phase welders to make them perform like High amperage Multiphase welders. When you make them work hard, for medium let alone long periods, they continuously eat capacitors. I think Your capacitor company, may have run into this reality. Capacitors are not suited to long duty cycles.